The Government has published new example food menus and useful dietary guidance to support healthier food provision in early years settings. The example menus were created by the Department for Education, Department of Health and Public Health England in order to support settings to offer food and drink in line with current government dietary recommendations. The guidance shows providers how they can meet the Early Years Foundation Stage welfare requirement to provide ‘healthy, balanced and nutritious’ meals for children. The Government hopes that these menus and the new guidance will help settings to run in a cost-effective way, as well as helping to reduce childhood obesity over the next decade. Some recommendations include limiting cakes, biscuits and desserts, offering just milk and water to drink and not giving dried fruit or popcorn as snacks. Other tips for cost-effective meals include planning menus in advance to control ingredient costs, buying ‘value’ brands (especially for staple foods), freezing batch portions and minimising food waste. The new guidelines are an update from the Children’s Food Trust food and drink advice published in 2012. However, the new guidelines cater for younger children from six months to a year and now cover breastfeeding and weaning. The Children’s Food Trust guidelines state, ‘Fruit juice should be provided only at meal times (not with snacks) and should be diluted (half juice half water).’ The new Government guidance is that childcare settings should only provide water and milk to reduce the ‘free sugars’ that children are consuming. The new advice also includes information on desserts such as when they should be served, as well as what type should be included in main meals. Settings are advised to provide a variety of desserts every week from each of the food groups including hot fruit-based desserts, milk-based desserts, yoghurt/fromage frais, cakes and biscuits containing fruits and cold desserts. There is also food safety advice which outlines how to avoid the risk of choking. This includes cutting sausages into strips rather than chunks and removing the skins for infants, cutting cheese into strips rather than chunks, avoiding popcorn as a snack and not giving children jelly cubes from a packet as part of messy play. The new guidance covers a three-week period. An example of this is an autumn and winter menu for children ages seven to twelve months which includes wholemeal toast fingers with boiled egg and tomato for breakfast, haddock (or lentils) and ratatouille with pasta shapes for lunch, couscous and chickpea salad with broccoli florets for tea. The spring and summer menu for children aged one to four includes berries and yoghurt with toasted oats and cornflakes for breakfast, toasted crumpet with spread and strawberries for snacks. Thai chicken curry (or Thai tofu curry) with white rice for lunch and a blueberry sponge cake for dessert, and a pea and asparagus frittata with new potato salad for tea. Rachael Thompson, the co-owner of the setting who won this year’s Nursery World Nursery Food Award, says she welcomed the menus but stated for some nurseries it can be hard to achieve. “The guidelines are good, solid, clear and concise. There is a great deal of fear, ignorance and a lack of confidence around food – we see it with our own staff,” she commented. She said, “The main issue with the menus is that settings would need a cook with them for a significant portion of the day. In smaller settings and for childminders, this could prove challenging, particularly with breakfast. “The example menus include options such as sliced or mashed hard-boiled egg and tomatoes with wholemeal bread and spread for breakfast, which would mean a cook starting early in the day, which some settings couldn’t afford, or practitioners coming out of ratio to make. 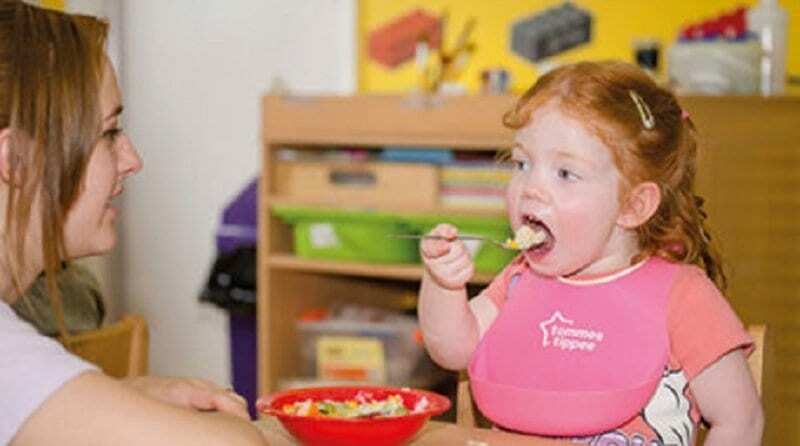 The British Nutrition Foundation (BNF) is part of the Early Years Nutrition Partnership; they have said that they think the menus are a useful resource for settings who are already under a lot of pressure. A BNF spokesperson said, “It’s vitally important that children learn to eat well in early life, and early years settings can play a key role in supporting good health through the foods and drinks they provide. “However, we know that early years settings are under many pressures, from funding to all the statutory obligations they have to fulfil, and so getting food provision right is one of many competing priorities. Putting together a healthy menu for young children from scratch is a big challenge, and so example menus that can be adapted to meet the needs of a setting should be a really useful resource. Kim Roberts, chief executive of charity Health, Exercise and Nutrition for the Really Young (HENRY), said: “We greatly welcome the updated guidance. The early years menus are a good tool for nurseries and childminders. Settings can further benefit from training to help them put the guidance into practice.